PLEASE NOTE: Due to increased demand at this time, some sizes may be backordered and may ship separately. If you have any questions, please contact us. 3" round metal button pin with safety pin back. Tinned steel base. Actual color is somewhat brighter than image shows! What a ‘charm’ing way for her to show off her S’mores! Neon blue chain bracelet has four charms: two Girl Scout cookie charms, one S’more charm and one solid green trefoil charm. Lobster claw clasp closure. 6½" metal bracelet and resin charms. Made in USA. Put some sparkle in your step! Waist pack has iridescent, rainbow-colored, holographic sparkle design. Front zipper closure. 28" black strap at back adjusts to 44". 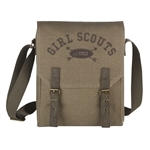 “Girl Scouts” and trefoil outline imprint on bottom. Interior pocket. Lightweight and compact. Can be worn as crossbody bag. 9" x 5½" x 1". Polyester. Imported. 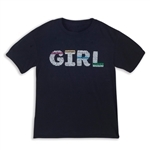 Comfy, classic tee with inspiring screenprint message. Shaped fit. Heather grey cotton jersey knit. Imported. Show off your troop pride with this great Troop Rules tee! These great new shirts are available in both youth and adult sizes.